What to know: A little something for the child in us all - witty tunes about loving moms and dads, squirting grapefruit, marshmallows and Spanish sopaipillas. You just can't go wrong with an album filled with witty tunes about loving moms and dads, squirting grapefruits that nearly blind you, marshmallows, Spanish sopaipillas, donuts, dinosaurs, leprechauns and...you get my point: a little something for the child in us all. The humor is engaging, the musicianship is sound and the characters' voices and the child performances are terrific. And, if this review is not enough to whet your appetite then my bad! This is a fun album! Check it out. 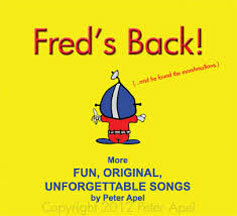 The songs are upbeat and will hold any child's attention. The structure is similar to Peter Apel's first release, "There's a Dinosaur On My Head." He knows what works and will hold a child's attention. It is well paced, has a great variety of musical styles and instrumentation. It is very enjoyable. Reviewed by John Wood. Thirteen original songs including "Lipstick Blah Blah," "I Love Sopaipillas" and "Bombones (Marshmallows)" come together in a catchy collection that entertains kids and parents alike. Engaging digipack contains an eight page mini-booklet with colorful illustrations, liner notes and song lyrics.